Perhaps more than anything else, Kenya is re-known all over the world for its track and field athletes. Since the 1960s, Kenya has produced more world class athletes, more world record holders and more Olympic Medalists in long distance running than any other country. Kenya's history in Track and field goes back to 1951 when the Kenya Amateur Athletics Association was formed. 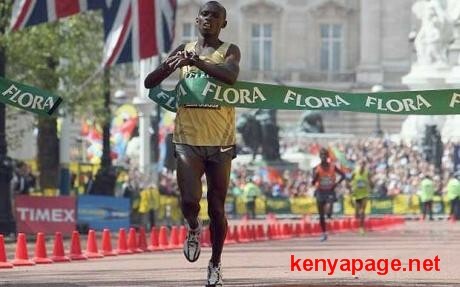 Soon it became apparent that Kenya had a reservoir of talent which if tapped could produce several world Class runners. At the Rome Olympics of 1964, Wilson Kiprugut Chuma became the first Kenyan ever to win an Olympic medal when he won a bronze in the 800 meters. At the Mexico Olympics of 1968, Naphatali Temu became Kenya's first ever Olympic gold medalist when he won the 10,000m, outsprinting Mamo Wolde of Ethiopia. But it was Kipchoge Keinos heroic achievement that was most memorable. Keino was at the time suffering from gallstones and participated in the Olympics against his doctor's advice. He finished second in the 5000m and in the 10,000m he collapsed with only a few laps to go. He thus opted out of the 1500m final, which was to be run the following day, only to change his mind a few minutes before the race began. He then jogged from his hotel room and arrived just in time to start the race. He won the race in style finishing 20 meters ahead of the field. Kip Keino is the only Kenyan sportsman ever to appear on the Cover of world famous sports magazine, "Sports Illustrated" (December 21 1987). 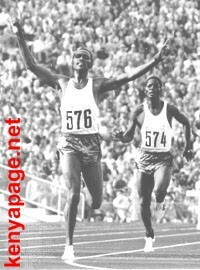 Kip Keino celebrates victory at Mexico 68. By the 1972 Munich Olympics, Kenyan athletes were now reknown. But it came as a great surprise when Kenyas 4 X 400m relay team beat the fancied European teams to win the gold medal. Kipchoge Keino and Ben Jipcho finished first and second in the steeplechase. Perhaps the most remarkable feat ever achieved by a Kenyan was Henry Ronos 4 world records in 81 days achieved in 1978 when he set a world record in the 10,000m, 3000m Steeplechase, 3000m flat and 5000m. As luck would have it, Ronoh was unable to parlay his talents at the Olympics, as Kenya did not participate in either the 76 or the 80 Olympics. This long layoff affected Kenya negatively come the 84 Olympics, Kenya achieved only 2 track medals : Julius Korir's gold in the 3000m steeplechase and Mike Musyoki's bronze in the 10,000m. In 1986, John Ngugi started a legacy of cross country dominance by winning the first of his 5 Men's Cross country championships. Prior to that, no Kenyan had won the world cross country championships. At the 4th All Africa games in 1987, Kenya showed its track prowess by winning every men's long distance event. At the world championships of 1987, Billy Konchellah defied asthma and tuberculosis to win the gold medal in one of the most heroic performances ever. Douglas Wakihuri emerged from obscurity to win the marathon , while Paul Kipkoech beat the rest of the field by over 50 metres to win the 10,000 metres. At the Seoul Olympics of 1988, Kenya's track team won four gold medals in what was Kenyas most memorable performance. John Ngugi finished nearly 50 meters ahead of the field in 5000 meters. Julius Kariuki and Peter Koech finished first and second in the steeplechase, Peter Rono won the 1500m in spectacular fashion, while in the 800 meters, Nixon Kiprotich and Paul Ereng gave a clinic in teamwork to ensure that Ereng won the gold medal. At the 1992 Barcelona Olympics, Kenya completed a clean sweep of the steeplechase , led by Mathew Birir. Susan Sirma became the first Kenyan woman to win an Olympic medal when she won a bronze in the 1500 meters. Samson Kitur became the first Kenyan to win an medal in a sprint event when he finished third in the 400 meters. William Tanui and Nixon Kiprotich finished first and second in the 800 meters. Sally Barsosio became the first Kenyan woman to win a world title when she won the 10,000 meters at the World championships of 1997. The 96 Olympics in Atlanta was a relative let down for Kenya, with only one gold medal by Joseph Keter who edged fellow Kenyan Moses Kiptanui. Pauline Konga won a silver medal in the women's 5000 meters. Besides dominating the track, Kenyan athletes notably John Ngugi and Paul Tergat dominated the world cross country championships, winning the team title consecutively for more throughout the late 1980s to the 1990s. Athletes such as Moses Tanui, Ibrahim Hussein and Cosmas Ndeti , the late Sammy Wanjiru, Wilson Kipsang, Dennis Kimetto, Evans Ruto, Patrick Makau and Geoffrey Mutai have stamped their names on prestigious marathons all over the globe such as the New York marathon and the London Marathon. Kenyan athletes have also dominated big money road races all over the globe , leading to resentments by other athletes and sponsors who tried to bar Kenyans from competing in such races. The late Sammy Wanjiru winning the 2009 London Marathon. Kenyan women who for years were unable to match the men , started to come up strong with several Kenyan women winning marathons and road races all over the world at the beginning of the new millenium. Tagla Lorupe set the world record in the women's marathon and also set records in the 20, 25 and 30km distances. Catherine Ndereba won the Boston marathon in 2000 and went on to win two gold medals at the world championships of 2005 and 2007 and a silver medal at the 2008 Olympics. In the 2008 Olympics, Kenyan women started to perform just as well as the men. Pamela Jelimo set the world of athletics alight by running incredibly fast times in the 800m, culminating in her gold medal in the 800m at the 2008 Olympics. Janeth Jepkosegei was second. Nancy Lagat shocked everyone to win the women's 1500m at those same Olympics. 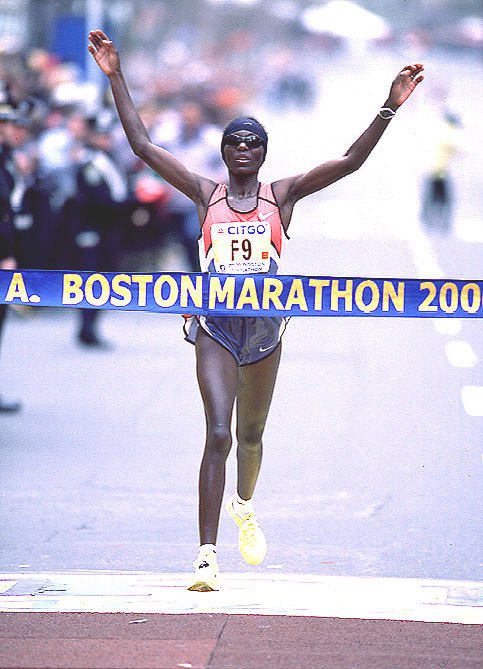 Catherine Ndereba surprised many when she won Boston 2000. All in all, Kenya has won more Olympics and world championships medals than any other African nation. Kenya has also excelled at the world youth and junior Track and field championships and have topped the medal table on several occasions well ahead of well funded programs in Europe. Noah Ngeny and Joseph Lagat literally ambushed world record holder, Hicham El Guerrouj of Morocco to win the 1500 metres. Sadly Ngenys career was ended by injuries suffered in a car accident. The 2008 Olympics in Beijing were the best ever performance by Kenya. 6 gold, 4 silver and 4 bronze medals represented Kenyas medal haul. Gold medals came via Nancy Lagat, Pamela Jelimo, Brimin Kipruto, Asbel Kiprop, Wilfred Bungei............But it was a hold medal by the late Sammy Wanjiru in Olympic record time that was most memorable. It marked the very first time a Kenyan had won the Olympic marathon. By 2009, it could be argued that Kenya was at the peak of its athletic powers. 4 gold medals at the 2009 world championships and 7 at the 2011 world championships attest to that fact. The 2011 World championships Kenyan women runners put on a spectacular show. They occupied the top four positions in the marathon and the 10,000m and the top two positions in the 5000m. The most notable performance was that of Vivian Cheruiyot who won both the 5000m and the 10,000m. She should have won the world athlete of the year in 2011 but was seemingly cheated out of it. At the 2012 Olympics, David Rudisha and Ezekiel Kemboi gave performances to remember. Rudisha blew away the field to break the world record, becoming the first man ever to run the 800m in under 1:41. 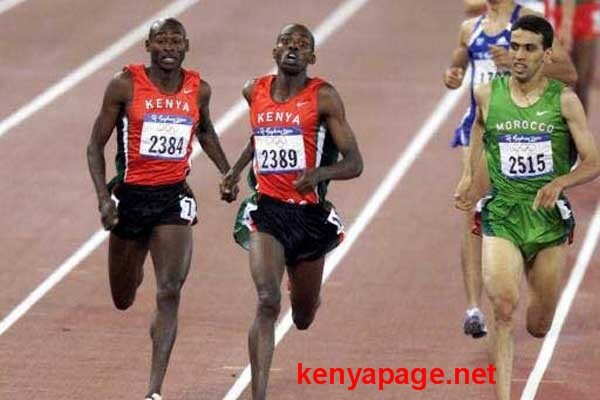 Ezekiel Kemboi won by such a margin that he was able to run clear across the 8 lanes before crossing the finish line. Kenya somewhat recovered from their lacklusture performance in London to win 5 gold medals at the 2013 World Athletics Championships. Most notable was the unheralded Eunice Sum who emerged from nowhere to win the womens 800m when few even expected her to reach the final. Indeed Kenyan women outperformed their male counterparts at the 2013 world champiuonships, winning three gold medals, with the other medals coming from Edna Kiplagat who retained the marathon world title she had won in 2011 and Milcah Chemos in the 3000m Steepchase. Asbel Kiprop and Ezekiel Kemboi won the 1500m and 3000m steeplechase respectively. Aside from Edna Kiplagat winning the world championships titles, Kenyan women were performning spectacularly at the beginning of the teen years with Priscah Jeptoo establishing herself as the top female marathoner in 2013 and Mary Keitany close behind. Jeptoo's performance in the 2013 New York marathon was memorable in that at one point she was three minutes behind the leading Ethiopians but accelerated and passed them over the last few kilometres. Kenyan male marathoners went on a world record breaking spree during this period. First it was Patrick Makau who broke the record previously held by Ethiopian legend Haile Gebreselassie. Then Wilson Kipsang and Dennis Kimetto set new world records in 2013 and 2014 respectively. As a side note, Paul Tergat had been the first Kenyan ever to hold the world marathon record.